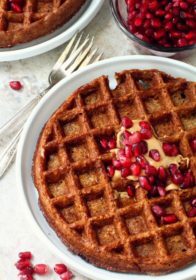 An incredibly easy to make recipe, these Gluten-Free Pumpkin Protein Waffles work as a delicious breakfast, snack, or even cozy dessert! These waffles have that perfect texture. You know what I’m talking about – when they are slightly crispy on the outside and fluffy on the inside. They also have a slight sweetness (even without adding any sugar) and of course that pumpkin spice flavor that we all love. No one will guess that they’re actually healthy and naturally gluten-free. You’re going to love how quick and simple this recipe comes together. Surely you can spare 10 minutes to throw it together. I promise, it’s worth it. I have this simple Belgian waffle maker and it’s been doin’ its thang for ages. It creates the classic fluffy, huge waffles (my favorite kind!). 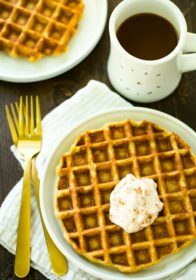 The batter can be mixed in your blender (my favorite blender), which then makes the batter so easy to pour straight onto the waffle iron. 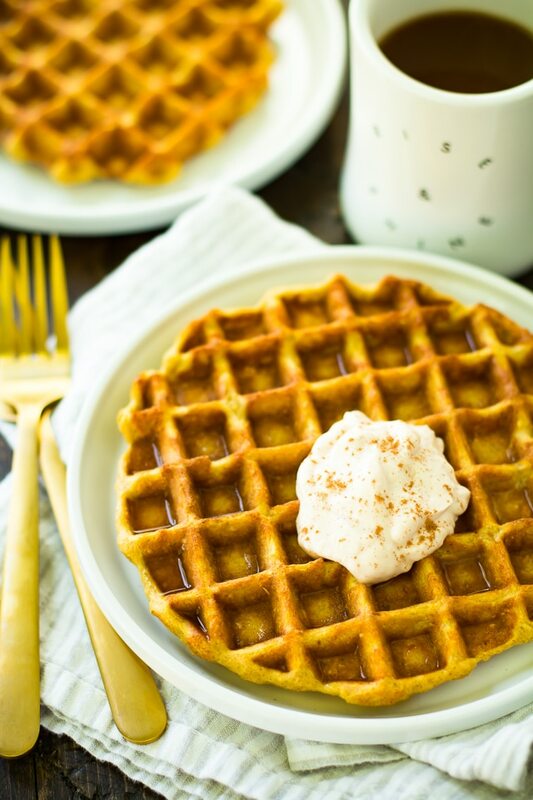 These waffles just might become your new favorite breakfast! With the lovely texture, taste and nutritious benefits what’s there not to love?! 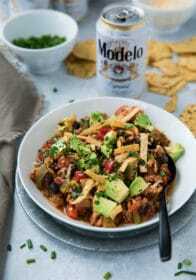 Not to mention they are so easy to whip up! My whole family has been requesting these on repeat! We usually enjoy them with just a little added pancake syrup, and they’re pretty amazing topped with pumpkin-flavored yogurt too. 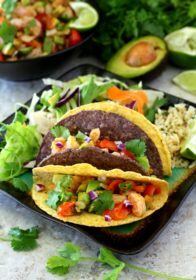 Be sure to comment, if you try this recipe, and let me know what you think! Also, be sure to tag a photo #kimscravings on Instagram. Preheat waffle griddle. 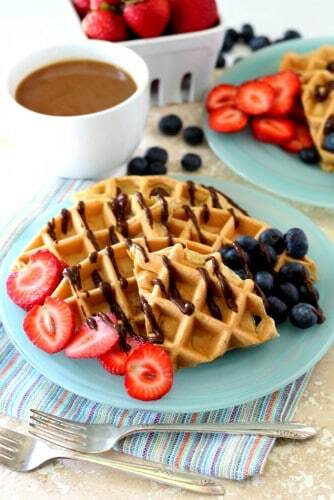 Meanwhile, place all of the ingredients for the waffles in a blender, and blend until the batter is smooth. 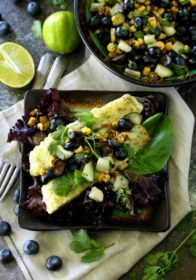 (If using oat flour, simply stir everything together in a bowl). Add water or almond milk to get a consistency that will pour. Spray waffle iron with non-stick spray, and pour 1/2 cup batter into waffle iron when ready. (Please note: the amount of batter used, and servings of waffles may vary depending on the size of your waffle maker). Close waffle maker, and remove waffle when ‘ready’ light comes on, (or when waffles are slightly golden brown). 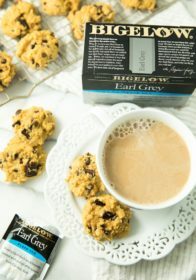 Enjoy warm with low sugar syrup if desired. *Use gluten free oats if sensitive. 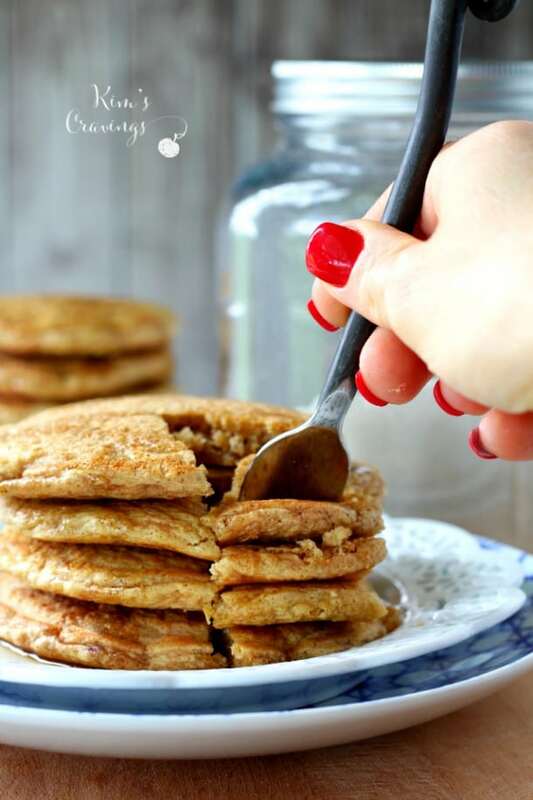 You could also use 1/4 cup oat flour. 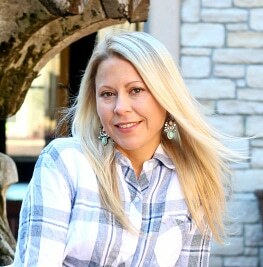 **Nutritional information calculated using IdealLean Multi-purpose protein powder. 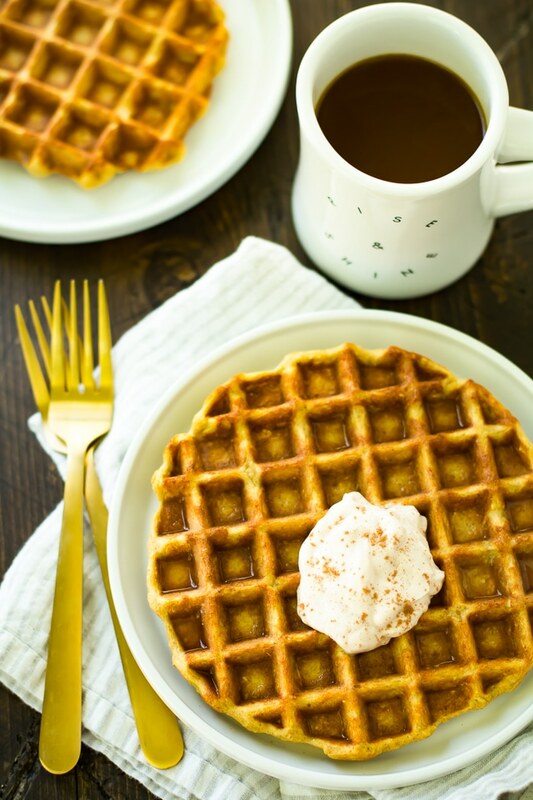 Try some other favorite waffle recipes! 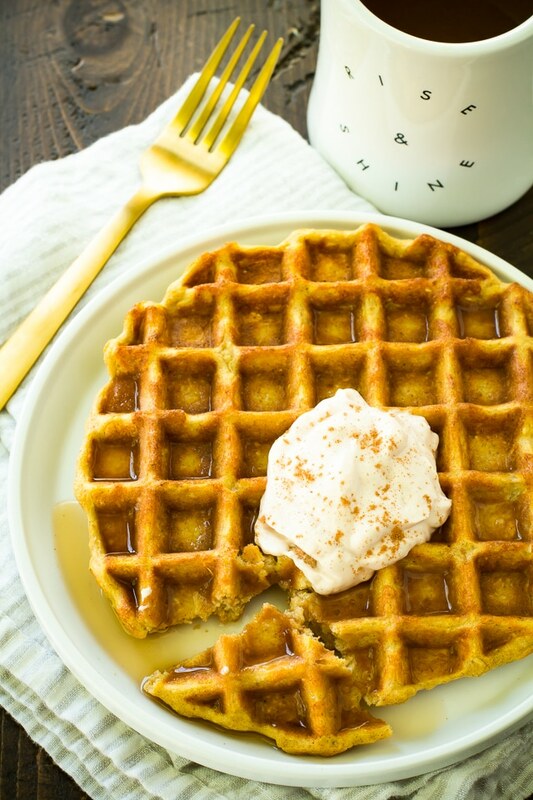 Gluten-Free Pumpkin Oat Waffles – this is a similar recipe, but without the added protein. It also makes four waffles rather than just two. 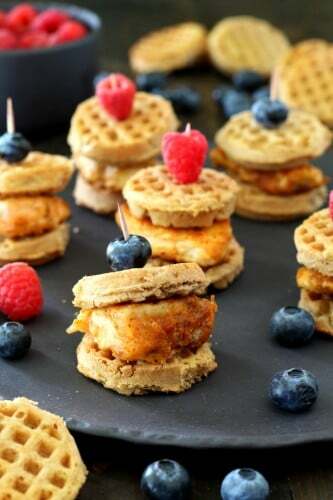 Mini Chicken Waffle Sliders – these are made with my favorite paleo chicken and Van’s mini waffles. My kids love these! 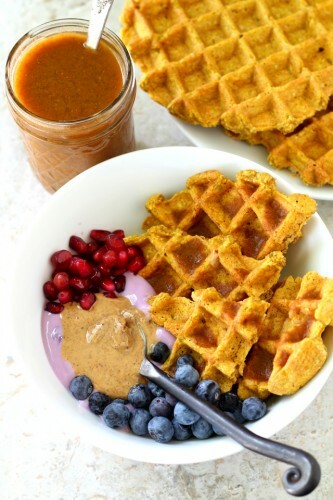 Low Carb Protein Waffles – my go-to breakfast or snack! I have one of these almost every day! Have you enjoyed pumpkin, yet, this season? What are you waiting for? These waffles are calling your name! 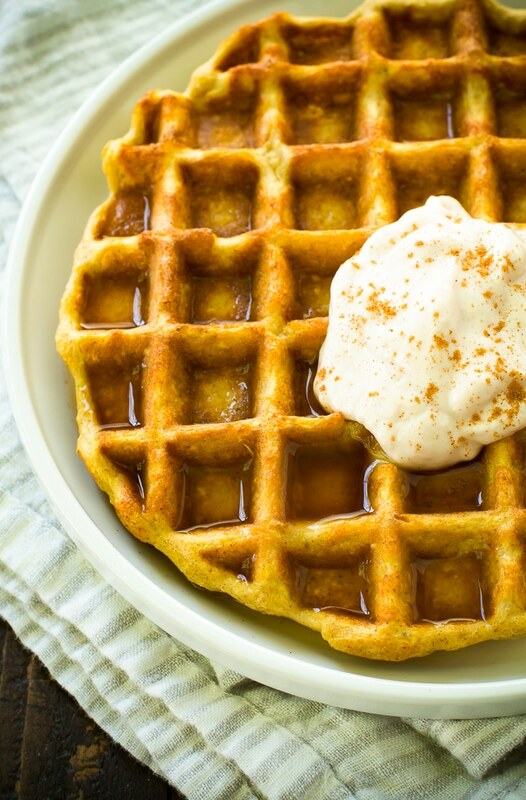 I just tried this pumpkin protein weaffle recipe and did I do something wrong or did you forget to add some kind of liquid to the recipe? I’ve read it over and over and looked at your other waffle recipes and they call for almond milk. Help!! Mine is one blob that won’t blend. Adding almond milk to try it. Please give me advice! 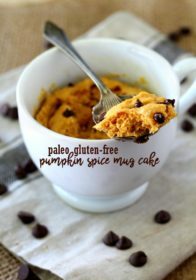 It’s pumpkin season so I am craving everything pumpkin, even have pumpkin protein powder from Amy Myers, MD. Thanks! Yes, just add almond milk or water until you get the consistency right. It should be pretty thick, though. Hope it works for you! I’ll update the recipe card to make that less confusing.